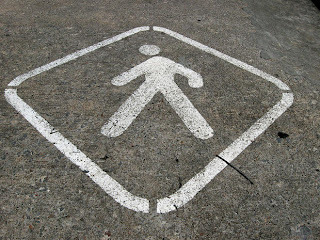 Lean Simulations: Lean Waste Walk Template - Can You Walk and Write? Lean Waste Walk Template - Can You Walk and Write? 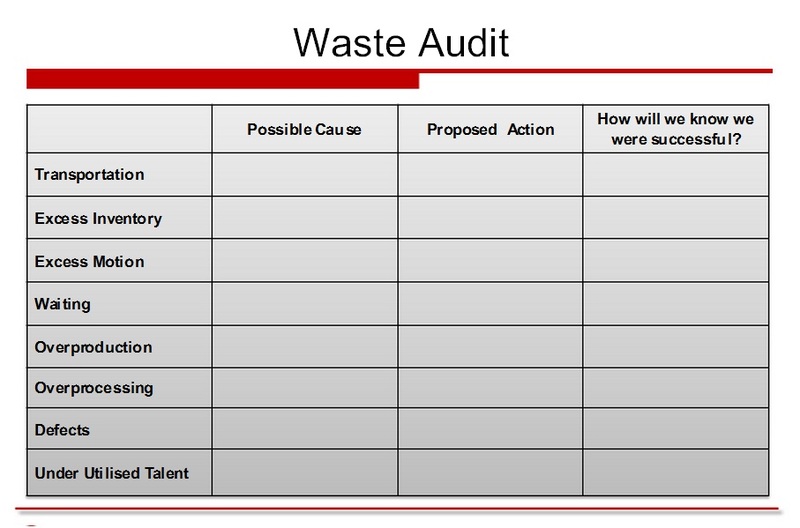 After writing a detailed post about waste walks, I decided to use a template in one of my kaizen events. While we had a goal to focus on in our specific process, I thought a short waste walk would be a good way to review the 8 wastes and introduce the team to the process. Normally we have a keen eye for waste, but I haven't used a waste walk template before. I dutifully looked at the informative slide show from last week and picked up the audit sheet at the end. We used a similar sheet, but I fine-tuned my own version in Excel. What I found was that the waste audit form was comprehensive, covering all the 8 Wastes. Excellent! However, there wasn't enough room to write down all the wastes. In particular, if there was different types of the same waste identified, there was only room for one to be written down. And the opposite applied if there wasn't a specific waste. No Waiting? Leave it blank. . .
At the end of the walk, everyone's sheet had lots of tiny writing crammed into some of the boxes and blank spaces in the other ones. The audit sheet wasn't balanced! But guess what? We reviewed the information and came up with a great list of wastes and resolutions. Ultimately, the entry sheet doesn't matter. The actions do. Of course I couldn't just leave it. After the kaizen event wrapped up and I summarized our data, I thought about ways to make it smoother for next time. 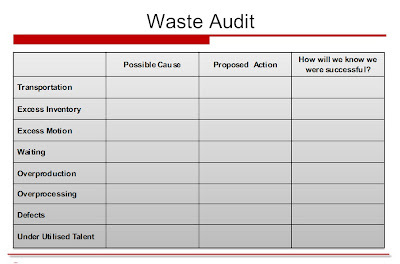 How could I balance the waste walk and kaizen the kaizen event? Tonight I put together this new waste walk template. Rather than having a line for each waste, I listed all the wastes across the top. Now each line can be any type of waste you find. After writing down the issue, just identify which of the 8 Wastes describes it best and write it in the "Type" column. When you review the waste walk results as a team, you can still go through all the wastes and check if any were missed. So, here it is! My improvement of the improvement process. I tried to keep it as simple as possible, since simple works for me. By the way, the best tool to use while walking and writing is a clipboard. Any notebook that opens into a book is terrible for writing while walking. Just remember to look up every once in awhile! Try it out and leave some feedback in the comments! I've added this post to my continuously growing list of lean tools and downloads! Thank you! I hope to see more news from you.